Civil forfeiture allows law enforcement to seize and keep cash, cars, home and other property without ever convicting someone of—or even charging them with—a crime. And for years, officials in Philadelphia have been using civil forfeiture to take as much as possible from city residents. Even worse, law enforcement agencies are allowed to keep the property for their own use or sell it and pocket the proceeds to pay for salaries, equipment and other expenses. This direct financial incentive is one of the many reasons why Pennsylvania earned a D- in Policing for Profit, IJ’s 2015 landmark survey of forfeiture laws. Philadelphia’s unchecked use of civil forfeiture has generated a $5.6 million annual stream of revenue for these law enforcement agencies. From 2002 to 2014, Philadelphia’s police and prosecutors took in more than $72 million in forfeiture proceeds by stripping thousands of city residents of over 1,200 homes, 3,500 vehicles and $50 million in cash. This represents more than 18 percent of the general budget of the District Attorney’s office—funds wholly outside the oversight of the City Council. The DA’s office uses these funds to pay, among other things, salaries of the very prosecutors responsible for deciding whether or not to forfeit property. And the police department has used forfeiture funds to pay for the construction of a $2 million building. 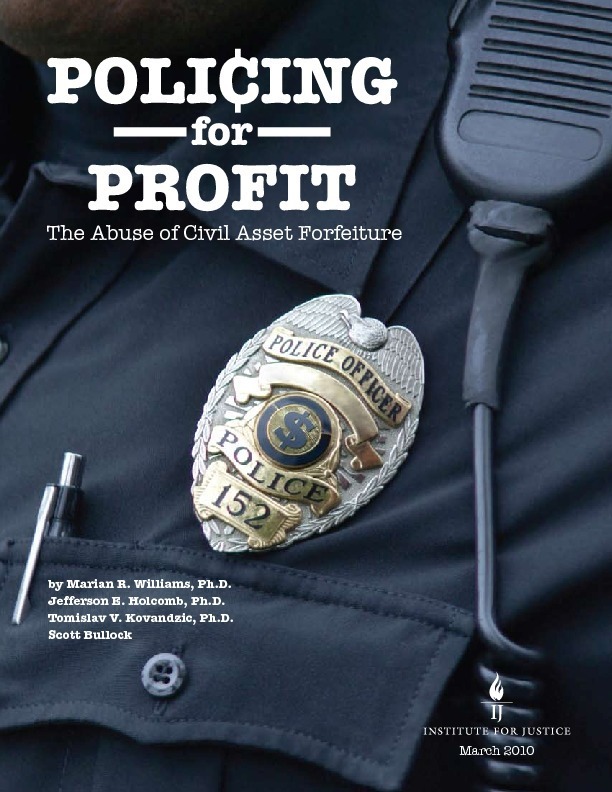 IJ client Chris Sourovelis knows all too well how the cash cow that is civil forfeiture threatens the rights and property of law-abiding citizens. In 2014, three weeks after Chris’s son was arrested for selling $40 worth of drugs, police showed up on his doorstep to kick Chris and his entire family out of their home. Chris, who owns the property, was never charged with any crime. To access his home, Chris was required to attend a “hearing” in Courtroom 478 in City Hall. But when he arrived, there was no judge and no public defender. Instead, prosecutors—the very ones who were trying to take his home—called all the shots in this courtroom and strong-armed the Sourovelis family into banning their son from their home as a condition of being allowed back into their home. But Chris and his family refused to be victims and they are continuing to fight back on behalf of other victims. Chris’s story is not unique. The Philadelphia DA’s office has turned the city’s civil forfeiture laws into a cash machine—taking as much property as possible to pad their budget without regard for basic constitutional protections. This is the heart of IJ’s lawsuit: Challenging Philadelphia law enforcement’s direct financial incentive to seize and forfeit property. Determined to end this un-American practice, Chris and three other property owners—Nassir Geiger, Norys Hernandez and Doila Welch—teamed up with IJ to file its first class action lawsuit. After defeating an attempt to dismiss the lawsuit, IJ secured class certification and now represents more than 20,000 other property owners in Philadelphia who have been caught up in the city’s forfeiture machine and want to stop the flow of cash from property owners to prosecutors’ paychecks. As a result, IJ’s clients are now officially standing up for the tens of thousands of other property owners who were threatened with civil forfeiture under a system where law enforcement had a conflict of interest in forfeiture proceedings based on the forfeiture profits they keep. IJ’s lawsuit challenges several other aspects of Philadelphia’s civil forfeiture scheme. After more than three years of litigation, IJ has won significant victories that have dismantled some of these unconstitutional practices. Before IJ filed suit, Philadelphia routinely seized homes and evicted people like the Sourovelis family without providing them with notice or a chance to argue why they should not be thrown out of their homes. Homeowners often faced an unpalatable choice: remain homeless or give up constitutional rights, like the right to live with relatives or the right to transfer property. Almost immediately after IJ sued, the DA’s office and police department stopped these practices. In November 2015, U.S. District Judge Eduardo Robreno approved a class-wide settlement agreement, ensuring that these outrageous practices would never happen again. For almost a decade, the First Judicial District permitted Philadelphia prosecutors to run a forfeiture “courtroom.” In the now infamous Courtroom 478, there was no judge. Instead, prosecutors took on judicial responsibilities like calling cases, forcing property owners to return to court by “relisting” their cases, dispensing legal advice, and even marking cases for default. IJ’s lawsuit stopped most of these practices. The First Judicial District implemented reforms beginning in October 2015: Trial Commissioners began presiding over forfeiture proceedings in Courtroom 478, which was equipped with digital recording equipment to ensure records of these proceedings. In January 2016, state court administrators finally abolished Courtroom 478—assigning dedicated courtrooms in the Criminal Justice Center to handle forfeiture matters. However, the court system has failed to fix all of its constitutional violations, forcing IJ to add them as defendants. Other practices that violate due process. Judge Robreno rejected the state judges’ (and, earlier, the DA’s office’s and city’s) attempts to dismiss these claims against them. IJ’s victory is a milestone for the organization, especially considering how procedurally difficult it is to sue judges (and how rarely it is done). Thanks to IJ, state court judges must now defend their unconstitutional civil forfeiture procedures in federal court. This is truly a landmark litigation achievement. IJ’s media team has helped make these plaintiffs’ voices heard, and the case has received broad local and national attention from outlets such as CNN, Last Week Tonight with John Oliver, The Philadelphia Inquirer and Slate. Despite some reforms by the state Legislature and state court system, the way forfeiture proceedings are conducted remain constitutionally weak. For example, property owners still are not afforded with a meaningful way in which to promptly contest the seizure of their property and get it back. And every day law enforcement officials are continuing to forfeit property and use the proceeds. IJ looks forward to continuing the fight against Philadelphia’s forfeiture machine, winning more historic victories and one day ending Philadelphia’s unconstitutional civil forfeiture practices. The Institute for Justice litigates in support of constitutionally protected individual rights, including the right to own private property free from unconstitutional governmental interference. The Institute for Justice has come to the defense of Americans nationwide to fight civil forfeiture, including the owners of the Motel Caswell in Massachusetts, the owners of Schott’s Market in Michigan, and the owner of a truck seized in Texas. 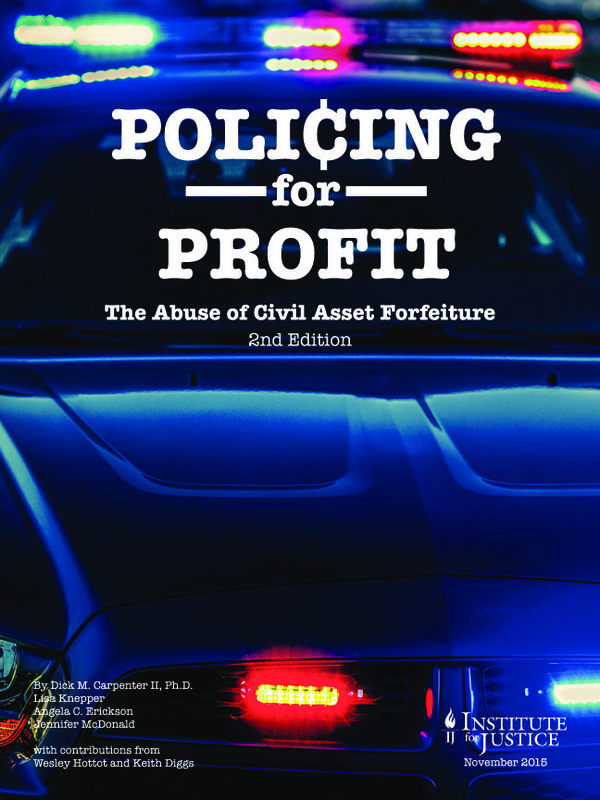 In 2015, IJ published the second edition of its landmark report on civil forfeiture, Policing for Profit. The challenge to Philadelphia’s civil-forfeiture program is led by Institute for Justice Senior Attorney Darpana Sheth, who works on IJ’s Civil Forfeiture Initiative and who litigates property rights and economic liberty cases nationwide. Working alongside Ms. Sheth is IJ Senior Attorney Robert Frommer and Attorneys Dan Alban, Milad Emam and Robert Peccola. David Rudovsky, a founding partner of the Philadelphia law firm Kairys, Rudovsky, Messing & Feinberg, will ably serve as local counsel. The Institute for Justice is based in Arlington, Va., and has offices in Arizona, Washington, Minnesota, Florida and Texas, as well as a Clinic on Entrepreneurship at the University of Chicago Law School.